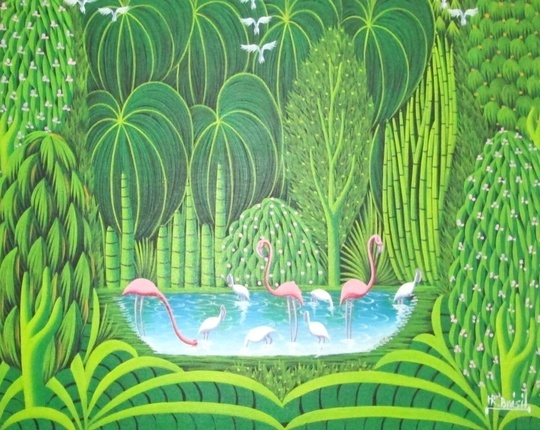 Born in Gonaives, Haiti, Brésil discovered his love for art at an early age and was always fascinated by flamingoes and landscapes, which explains his unique style. He won the Ispan-Unesco prize in 1981. His work has been exhibited in Haiti, the US, Puerto Rico, France, Italy, and Switzerland and has received recognition from the New York Times and the Miami Herald. His name is cited in major Haitian art books. Paintings by Bresil are highly imitated; therefore, we strongly recommend that you know your source before you buy one somewhere else!